Make the celeriac purée. Peel and roughly chop the celeriac, place in a saucepan and cover with the milk. Add the bay leaf and season well. Bring the milk to the boil, cover with a ‘lid’ of parchment paper and simmer gently for 40 minutes until the celeriac is tender. Remove from the heat and allow to cool slightly, then discard the bay leaf and blend the celeriac and milk in a food processor until smooth. Now pass the purée through a fine sieve into a bowl (it can be made up to 3 days in advance and kept in a covered container in the fridge). Place the cranberries in a bowl with the sugar. Cover with clingfilm and leave in a warm place for 3 hours until the cranberries soften slightly. Peel the parsnips, quarter them lengthways and remove the woody centres. 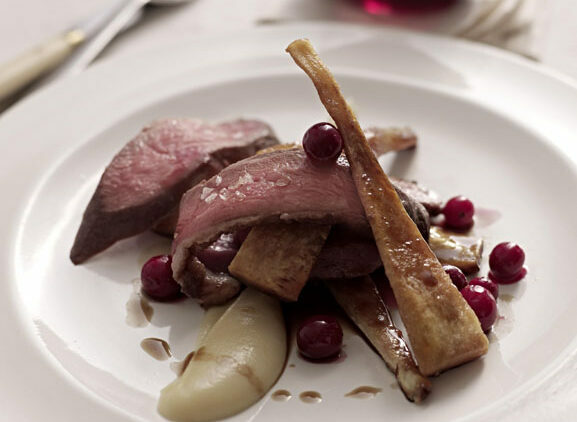 1 Place the goose on a rack in a roasting tray and roast for 45 minutes – the meat is best cooked pink. 2 Remove the goose from the oven and let the meat rest for 30 minutes. 3 Meanwhile, splash some olive oil into a hot ovenproof frying pan and fry the parsnips until brown all over. Add the butter, place the pan in the oven and roast the parsnips for 15 minutes. 4 Remove the breasts from the goose by running a knife down each side of the breastbone and along the carcass, lifting one breast off at a time. Place the breasts on a plate and set aside in a warm place for later. 5 Roughly chop the carcass and place it in a saucepan with the stock. Bring to the boil and simmer for 35 minutes. 6 Pour off the fat from the parsnips and add the honey to the pan. Place the pan on top of the stove over a low heat and allow the honey to caramelize for 6-8 minutes, stirring occasionally. 7 Strain the stock into a clean pan and add the cranberries, being careful not to add the juice that has formed in the bottom of the bowl. Gently reheat the celeriac purée, stirring constantly. 8 To serve, slice the goose thinly and stack the slices on individual plates with the glazed parsnips. Spoon the celeriac purée next to the goose and drizzle over the cranberries and sauce.